...by connecting the real and mobile worlds of your customers. 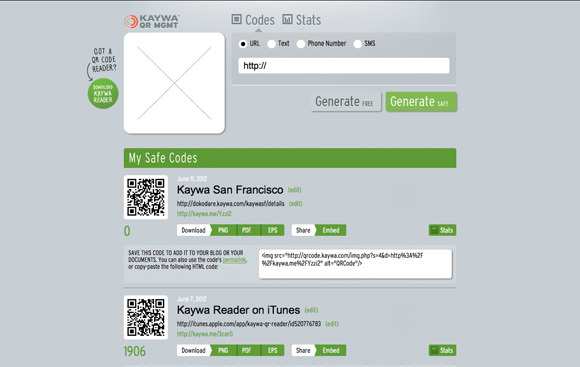 Kaywa's QR MGMT makes the administration and management of your QR Code campaigns simple and fun. Understand what your customers are doing! Create your QR Codes and save them in your account. Access them anytime from anywhere. Changeable (dynamic) QR Codes give you the ultimate in safety. 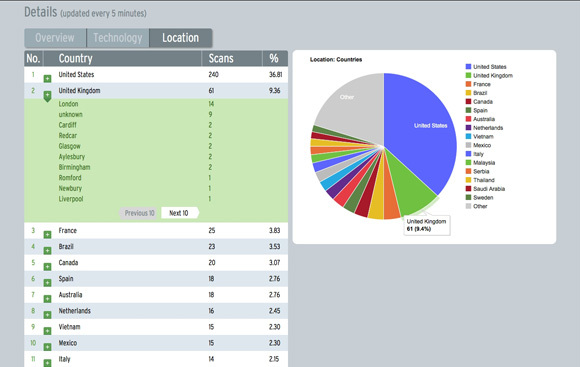 See all scanning results of your QR Codes and get to know your mobile customers. Professional features help you do serious business with QR Codes. 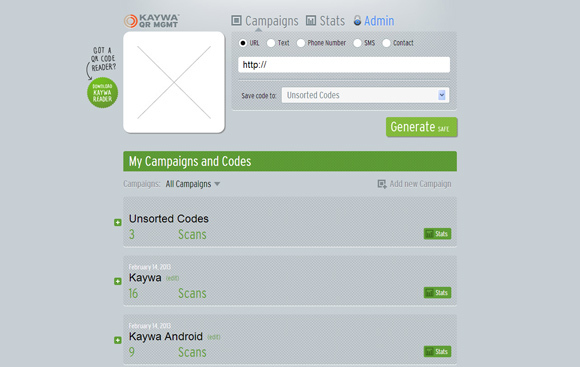 Kaywa’s services include logo integration, links to multiple URLs, custom URLs, and many others. You’re not on your own once you subscribe. Get the level of support you need. First on google, first to bring QR Codes to the West, solid in QR Mgmt since 2005. All reasons why big-name brands work with us – Universal, Fox, Citibank, Red Bull, B&Q, and the European Parliament among them. Learn about all of the features we offer below and choose your plan. 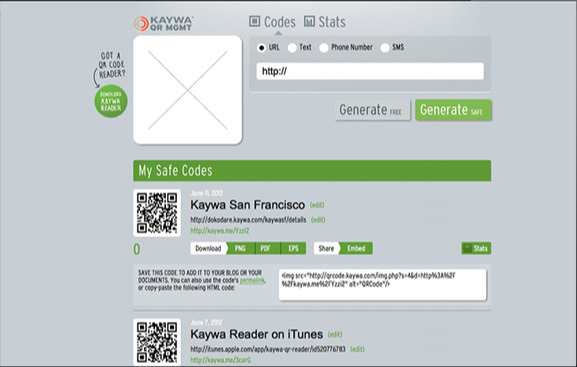 Start safely in the world of QR Codes with Kaywa QR MGMT. Create QR Codes quickly and easily on your own dashboard. Add the destination link, click and your QR Code is ready to use. Welcome to the world of QR codes! Many of our customers need to change their destination link at one time or another. With QR MGMT Codes, you always can. You can download your QR Code in different formats, such as PDF, PNG, and EPS. You can also embed your code directly on a website by clicking the “Embed” link. The number of QR Codes you can create depends on the subscription plan you choose. All of our QR Codes come with an unlimited number of scans. We will never interrupt service as the user experience is paramount to us. Your Codes remain valid indefinitely. We guarantee ad-free Codes. 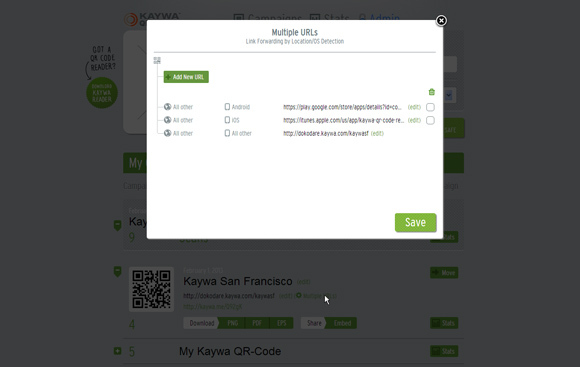 You can invite others to use your Kaywa account, depending on your subscription. These features are available on all plans. See what your customers are doing! 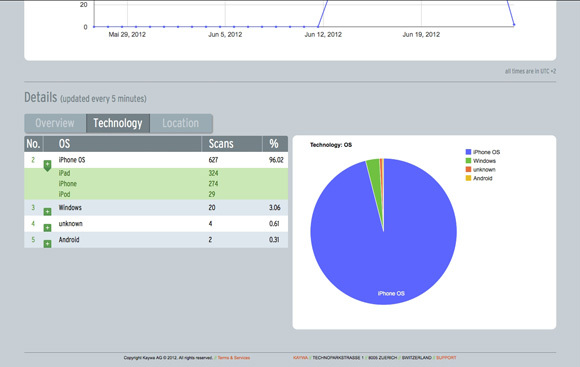 QR MGMT Analytics give you clues about scanning activity and hence the effectiveness of your marketing campaign. Get to know which devices and operating systems your customers are using, providing clues to which categories to invest in and planning strategies for the future. The following services allow you to get more out of your campaigns with QR Codes. Do serious QR Code business. You can link one landing page with many different QR Codes. Then, you can truly measure the effectiveness of your campaign through different communication channels. This will provide helpful clues in deciding where you should spend your marketing budget next! You can create one QR Code but link it to different URLs. Your prospective customer’s device will communicate with our codes and connect them to a specific URL. The ability to have multiple URLs is a convenient tool, allowing you to send customers to the appropriate app store or landing pages in different languages. A QR Code is more likely to be scanned when it contains a special color, shape, or logo. A code that is easy to identify and quickly discovered is a significant advantage over your competitors. It’s a great branding tool! Need to do some serious number crunching? With this service, you can export your reports to an Excel spreadsheet and analyze all of your data after a campaign. 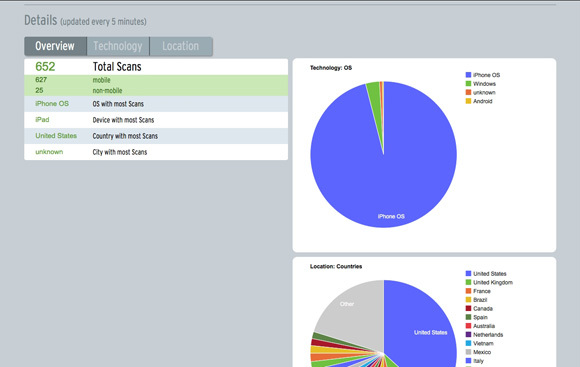 With a custom URL, your customer will only see your URL during the scanning process. All of the QR Code provider links are hidden. The customer only ever sees your brand! Several hundred QR Codes to create? This service automatically generates all of these codes, minimizing your work and maximizing efficiency! These features are available on PREMIUM and ENTERPRISE plans only. We are always here for you by phone or by email, based on your plan, in either our San Francisco or Zurich office. Find answers to the most commonly asked questions, as well as our contact details, on our FAQ page. 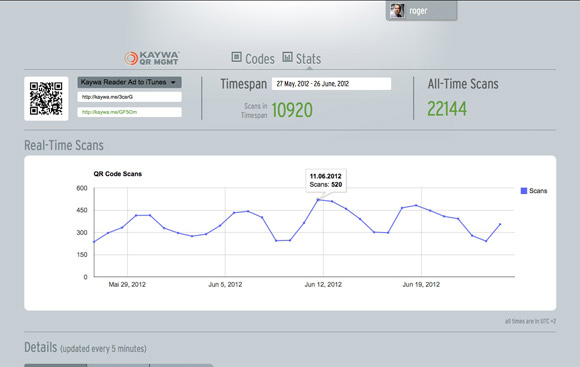 Subscribing with Kaywa means that your QR Codes and analytics are safe. We take care of them and your data. As a SaaS company , we know how important it is to trust your corporate partners. We’ve created QR Codes for the world since 2005, so you can be sure we’re here to stay. PLAY IT SAFE, CREATE YOUR ACCOUNT.